When I moved to Toronto in late 2007, the first thing I did after dropping my bags at my Craigslist sublet was go see the Ross Petty production of Peter Pan. Alone. Unaccompanied by minors. Which made me feel only moderately creepy. The annual Christmastime Ross Petty pantomime production is a Toronto tradition. The genre isn’t all that common on this side of the pond, but you leave these shows kinda wondering why it isn’t. Especially when names like Scott Thompson (Kids in the Hall) give some comedic cred to the ridiculousness in this year’s Beauty and the Beast. I was fortunate enough to catch a few minutes of an open-to-the-media matinee full of school groups. The pop culture witticisms and self-referencing comments are jammed into the script tighter than a [insert pop culture reference here], and part of the joy is watching how far over the kids’ heads some of them fly. Wikileaks and Sarah Palin shout-outs, not so popular. Creative use of the phrase “fork you”? Perfect. It works on two levels, though somehow both those levels end up being low. But hell, it’s fun. Beauty and the Beast runs at the Elgin Theatre until Jan. 2, and also stars Jake Epstein, Melissa O’Neil, Jake Simmons, Eddie Glen, and Mr. Ross Petty himself. If you’re not in Toronto, try to find a production like this in your area, because if there’s ever a time to experience feeling like a kid again, it’s Christmas. Hallmark moment for the win. 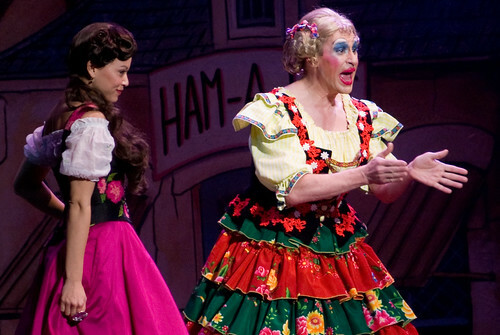 Scott Thompson as Aunt Plinky, alongside Melissa O'Neil as Bella, in the Ross Petty production of Beauty and the Beast. Photo by Sharilyn Johnson.